Both circuits have three binary select inputs (A0, A1 and A2) that CAN be latched by an active High Latch Enable (LE) signal to isolate the outputs from select-input changes. A "Low" LE makes the output transparent to the input and the circuit functions as a one-of-eight decoder. Two Output Enable inputs (OE and OE0) are provided to simplify cascading and to facilitate demultiplexing. The demultiplexing function is accomplished by using the A0, A1, A2 inputs to select the desired output and using one of the other Output Enable inputs as the data input while holding the other Output Enable input in its active state. In the CD74HC137 and CD74HCT137 the selected output is a "Low"; in the ?HC237 and CD74HCT237 the selected output is a "High". This is one package pinout of CD74HC137,If you need more pinouts please download CD74HC137's pdf datasheet. 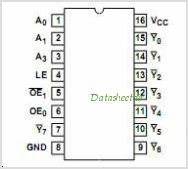 CD74HC137 circuits will be updated soon..., now you can download the pdf datasheet to check the circuits!